The last of the ‘twisted faves’ range is finally here to take a look at – this one an attempt to ‘twist’ the Delta Cream with the additional of Jaffa Orange. So far we have one hit and one miss in this new range – so does this biscuit tip the balance to the positive, or the negative? It’s worth noting that the biscuit this is based on is rather unprepossessing. I”m not a big fan of Delta Creams, and it has to be said my correspondents are not much enamoured either. “We only eat them if we have a desperate need for sugar’ comments Vanessa. So given that, I have to say my expectations for these was rather low. When you open the pack there is quite a strong orange scent, which is actually rather attractive. The biscuits have the same cocoa outer biscuit as the original, but the filling is replaced by an orange cream. It seems more orange in colour than the filling in the Orange Slice, although this might be an illusion owing to the darker biscuit. At some point I really must get a pack of Orange Slices and these new Jaffa Deltas to see if they are actually the same. And how about the filing in the Choc Orange Tim Tam? And can you still even get Choc Orange Tim Tams? Goodness, the mind boggles. Anyway, the upshot of all of this is that these biscuits are really quite good. Certainly a huge improvement on the original. As I proffered them around at work, there were various nods and ‘umms’ of approval as they were munched. The orange is nicely done, not to overstated, and blends well with the cocoa biscuit. Overall they are less sugary and sweet that the original, and are much more sophisticated. Well done Arnott’s. They do seem rather good at creating orange-flavoured biscuits. Well, the new tyres arrived, and sat in the shed for a few more weeks until at last I decided to put them on the bike. All easy-peasy,I thought, and within a few minutes I had taken the old one off the front, ready to replace it with a shiny new one. Put it over the rim; bit of air in the tube, tuck it in, press the other edge over the rim, la la la – I hummed to myself as I worked, figuring this was all be done in a few minutes and I’d be swishing along on my new rubber. And then I got to the final bit of tyre – you know, the really tight bit that’s a bit of a fiddle to get one. It did feel very tight, but I went back to the other side, worked the tyre around, pulling it around – something that is usually enough to do the trick. But no, it still stubbornly refused to pop on. I had a go with a tyre lever; I have a flat yellow one that works well for this.Then I tried a more heavy duty one. And another. Then I snapped one of them in half. And then bent another. No joy. That last bit of tyre just was not going on the rim. I scratched my head. Why was this so hard? I’ve replaced hundreds of tyres over the years, and never had one this intransigent. 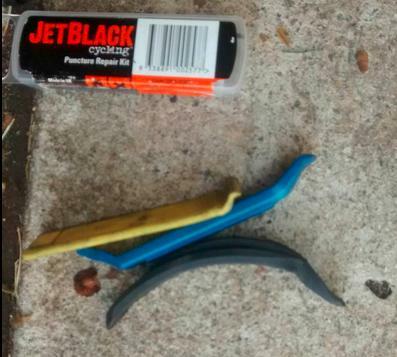 I’ve also never snapped a tyre lever, let alone two. I took the tyre completely off again, and started from scratch. Round we went, popping it on, la la la, until – the same problem. I wrestled with tyre levers some more, but nothing. This was getting ridiculous! Mrs Chillikebab came out to see how I was doing, and I had to admit that I actually could not put the tyre on the wheel. She suggested I might have to put the old one back on and go to the bike shop, and that made me feel simultaneously cross and ineffectual. 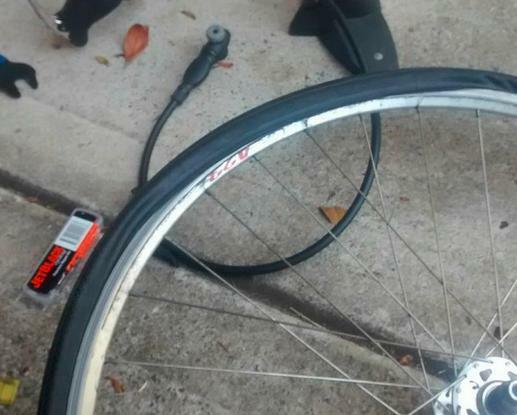 Buoyed up by anger, I had one last go at the tyre with two tyre levers, and – pop – it finally went on. Phew. I got my pump and started to put some air in. Whoosh. The air was leaking out as fast as it was going in. I had ripped a hole in it with the tyre levers; something that all the books say to watch out for, but which I had never before done. Incandescent with rage I grabbed one of the few intact tyre levers I still had left, wrenched the tyre back off the rim, took out the tube and patched it. This was not going to defeat me. I started again, this time paying a little more attention to where the tyre bead was sitting on the rim as it went on. It was sitting quite high on the rim, quite firmly held in the groove around the edge of the rim. I realised that by squeezing it in I could pop it deeper into the rim, against the rim tape. This gave me much more slack at the other side, and it was a doddle to pop the last bit of tyre over with just my thumbs. All so easy. As I then put air into the tyre, I could hear the tyre bead popping into its correct place all around the tyre. So why the dramas? Have I never had a rim with such a pronounced groove just around the rim before? I have no idea, but I was able to put the rear one on with no fuss at all – and this is a different rim (the original Salsa one, rather than the Velocity one on the front). A week or so ago, we looked at the first in the new ‘Twisted Faves’ range. Today, we come to the next one – the salted caramel version of the Monte Carlo. Salted caramel is certainly all the rage at the moment. It seems to be everywhere. Salted caramel popcorn, salted caramel ice-cream, salted caramel burgers, salted caramel latte – you can’t go anywhere in Sydney without seeing it. In terms of announcing ‘I am a cool hipster’ it seems to have taken right over from ‘artisan sourdough’ in the past few months, and no trendy cafe worth its, er, salt, seems to offer anything else. Of course, this is not the first time Arnott’s have jumped on the bandwagon – they already did it a few months ago in conjunction with that icon of hipsterism, Adriano Zumbo. So how does this new twist on the Monte Carlo work? Well, the first thing to note is that it does lose a great deal of its ‘Monte-Carlo-ness’. That strange, chewy centre is replaced by a much softer creme; so much does this change the character that it’s hard to believe they are the same biscuits either side if it. But that said, they are very nice. Not overly salty (less salty than the Zumbo creations, for example), but quite luscious, with the crubly biscuit and rich creme. You can chow through a lot of these in one go; they are very moreish. Hurrah Arnott’s, you’ve redemmed yourselves again, and shown that this ‘Twisted Faves’ line has promise. I’m going to give these eight out of ten.